Last week I stopped at the farmers market on my way to the beach. Since my favorite flatbread from Tony Boloney’s wasn’t being sold, I picked up some crepes for me and a friend from Crespella Gourmet Creperie. The crepe truck had a wide variety of offerings and I eventually settled on crepes with spinach, roasted red peppers and asiago cheese. I put the crepes in a cooler and headed to the beach with my kids. When lunch time rolled around I pulled out the crepes and they were beyond fantastic and definitely not your standard beach fare. My friend and I devoured them quickly because they were so delicious and also because the seagulls were chomping at the bit to get them. I could not get those crepes off of my mind and knew I had to recreate them. I made crepes once a few years ago so I had to find my crepe pan packed away in an box from my last move three years ago. 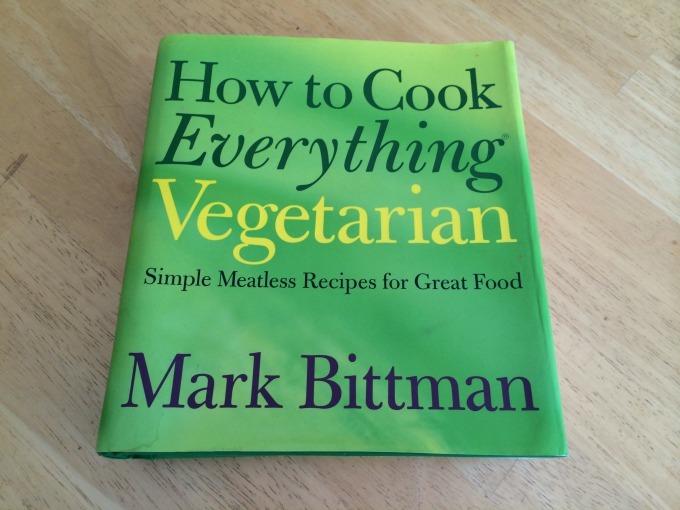 For the crepe batter I turned to my trusted bible, How to Cook Everything Vegetarian by Mark Bittman. This is my go-to book whenever I find myself with an unfamiliar ingredient from my CSA or whenever I need a basic recipe. This cookbook definitely gets the most use in my kitchen. For the crepe batter, you combine eggs, flour, milk, sugar and salt in a blender and then refrigerate it for at least an hour or up to two days. When ready to make the crepes, heat the pan for a few minutes and then melt some butter. Ladle in some batter and swirl it around until the pan is evenly covered. After about a minute or so you will see the edges of the crepe start to brown. At this point you can turn the crepe carefully or add your ingredients. I chose to add my ingredients since I watched my crepe being made at the farmers market and that’s how it was done. 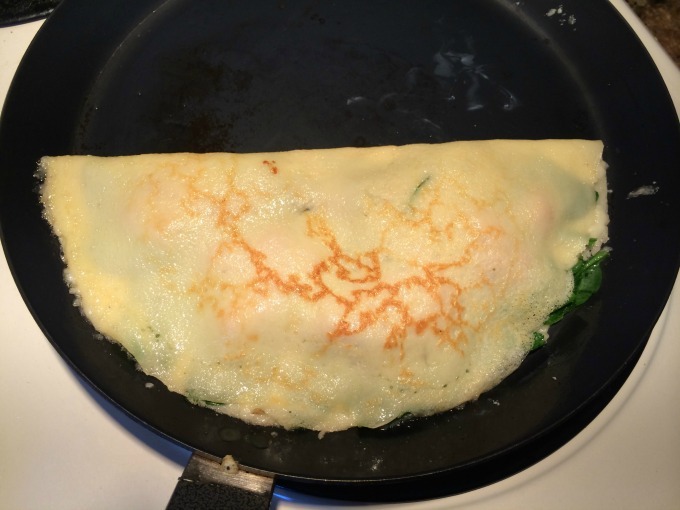 I had my asiago cheese, fresh spinach and roasted red peppers ready so I added them to the bottom half of the crepe and folded the top over. I gave this another minute and then carefully flipped it. The result was almost exactly as I had remembered from the week before. I loved how it turned out. I served it alongside a shaved brussels sprouts salad. 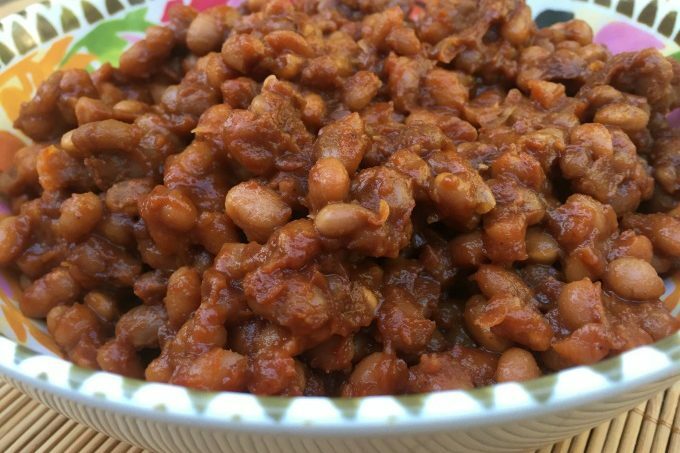 Yes, the recipe for that is coming soon! 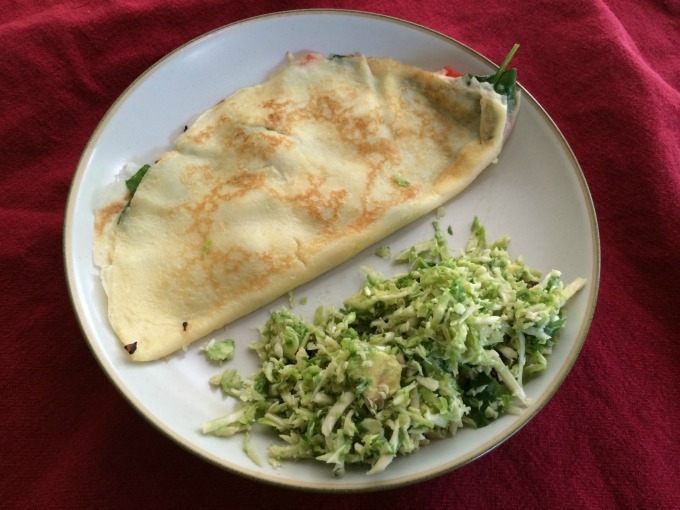 Mark Bittman recommends discarding the first crepe since it never works. I treated my first one as a tester and put it aside. Later on my daughter saw it and said she wanted it so I put some syrup on the crepe and she gobbled it up. This is impressive given the picky nature of her eating habits. So not only was this recipe a success with the savory fillings, but I am also going to add this to my breakfast repertoire. 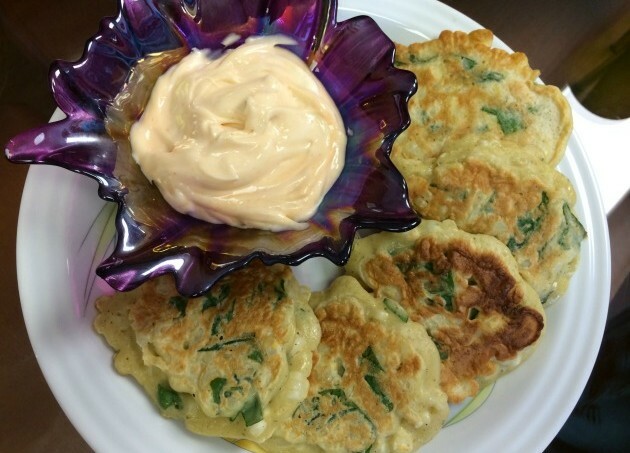 Since you can make the crepe batter up to two days in advance, it would be really easy and quick to make in the morning for the kids. I know that the sound of the word crepe might be intimidating, but I urge you to put aside those fears and give these a try. They won’t disappoint! 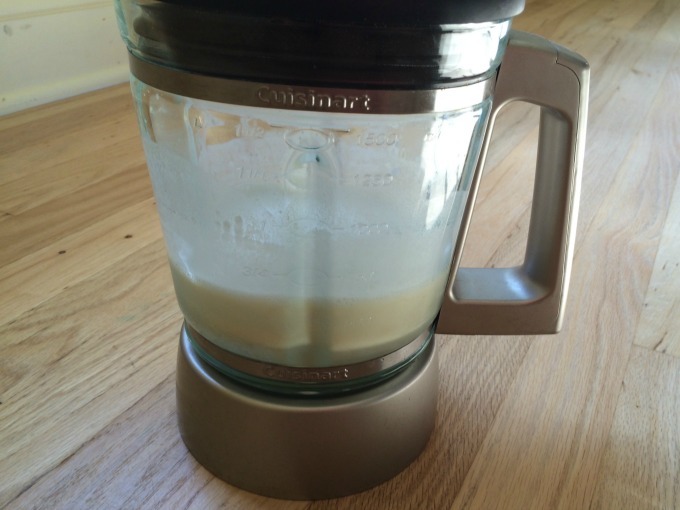 Combine milk, flour, salt, sugar and eggs in a blender until smooth. Use a spoon to make sure that all flour has been dissolved. 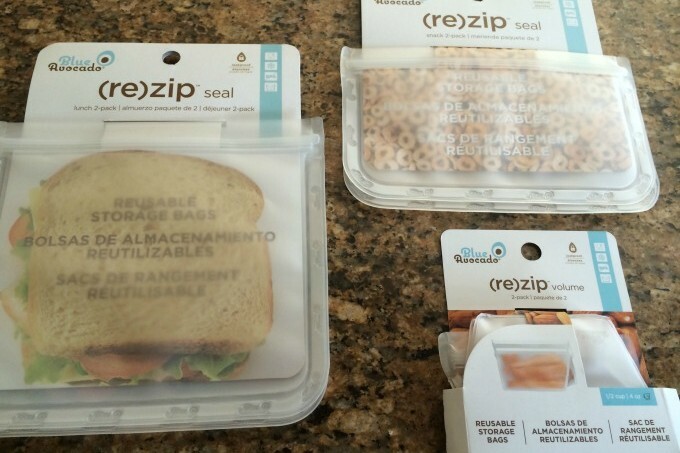 Refrigerate for at least an hour or for up to two days. Heat crepe pan over medium heat for a few minutes. Add a small pat of butter and swirl around. Ladle or pour enough batter into pan that the pan is covered. After about a minute or so you will see edges brown. 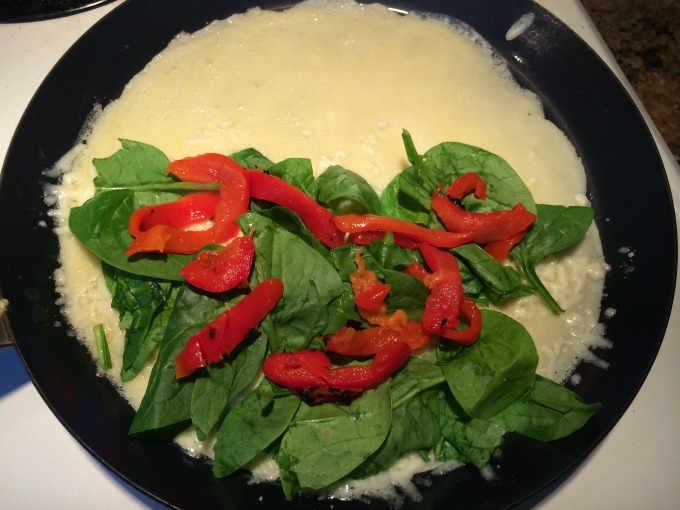 Add handful of cheese, spinach and roasted red peppers to bottom half of crepe. Carefully flip top over to cover bottom half. Cook another thirty seconds to one minute and then flip crepe and cook for another thirty seconds to one minute. Outside of crepe should be lightly browned. Your first crepe should be a tester to determine how much batter to add and how long to cook it. You will get four to six crepes out of this recipe. I've always been intimated by making crepes even though I'm very comfortable making pancakes. Your directions make it seem so easy! I've never made crepes, this makes me want to get a pan and give it a try. This looks divine! My mother made crepes for our family on Sundays. It was a family tradition carried forward from her mother, and you have inspired me to continue it! I usually make pancakes, but this Sunday I am going crepe! You can borrow my pan if you want. Let me know how they turn out! Looks yummy! I have never actually eaten a crepe, but everyone raves about it, so it is now on my "bucket list". oh my gosh that looks amazing!!! I wish I could make them but I can't imagine it being that beautiful! This looks awesome and I haven't had crepes in years. It was great meeting you last weekend in Philly.